From the award-winning team at Infinity Ward, comes the new action-thriller Call of Duty 4 Modern Warfare. Delivering the most intense and cinematic action experience ever, gamers can take hold of an arsenal of advanced and powerful modern day firepower in the most treacherous hotspots around the globe to take on a rogue enemy group threatening the world. As both a U.S. Forces and British Spec Ops soldiers fighting through an unfolding story full of twists and turns, players use sophisticated technology, superior firepower and coordinated land and air strikes on a battlefield where speed, accuracy and communication are essential to victory. The epic title also delivers an added depth of multiplayer action providing online fans an all-new community of community of addictive, customisable gameplay with persistent stats. Coordinated Assault and Support – Delivering the most visceral action thriller ever, the title covers modern battle from the soldier to the satellite, where the need for air support is critical to success. The adrenaline rush deployment enlists gamers to fast-rope from tactical helicopters, ride in an armada of attack choppers, utilise jets to remove enemy strongholds and even engage hostiles from thousands of feet above the ground inside a state of the art aerial gunship. Unparalleled Depth to Multiplayer – Multiplayer builds from the success of Call of Duty 2 delivering a persistent online experience for greater community interaction. 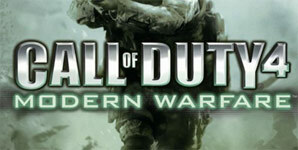 Featuring create-a-class options allowing players to customise gear that is best suited for play, to experience points enabling unlockables and perks, all the way to matchmaking and leaderboards for the latest in tracking, Call of Duty 4: Modern Warfare’s multiplayer is set to deliver easily accessible and addictive online play for all. Release date: 9th November 2007- on XBOX360, PLAYSTATION 3, PC and Nintendo DS. Limited Collectors Editions also available on XBOX360 and PC including DVD Making of Documentary, Walkthrough, Art Book and Poster.